This new major release of LinShare 1.11 brings a new functionality, called asynchronous upload. Once a large file has been uploaded on the server, the browser asks periodically the server to know that if the uploaded file is processed. There is no more long time connection opened, it was designed to work with short proxy timeout. Fix #12705 list search input refresh when reinit. Fix #1059 Bug on undownloaded shared documents delegation policy. Fix #1052 User menu unaccessable when no guest domain created. Fix #1060 Fix on thread entries download. Fix i18n for undownloaded documents alert. Fix #1042 Fix mysql 1.8 to 1.9 migration file. Fix #1040 Fix postgresql migration file 1.9 to 1.10. Fix NPE for share expiration date for received shares. This is a maintenance release with some little fixes, there is no need to upgrade the database. NB: you will need at least Linshare Ui Upload Request 1.0.4 if your are using this component. Fix #1037 cleaning mysql database sample. Fix #1016 bug on upload request filter. FIx #1018 bug on guest expiration date update on share creation. This is a maintenance release with two little fixes, there is no need to upgrade the database. Fix #1018 - Bug on guest expiration date update while sharing a document with it. 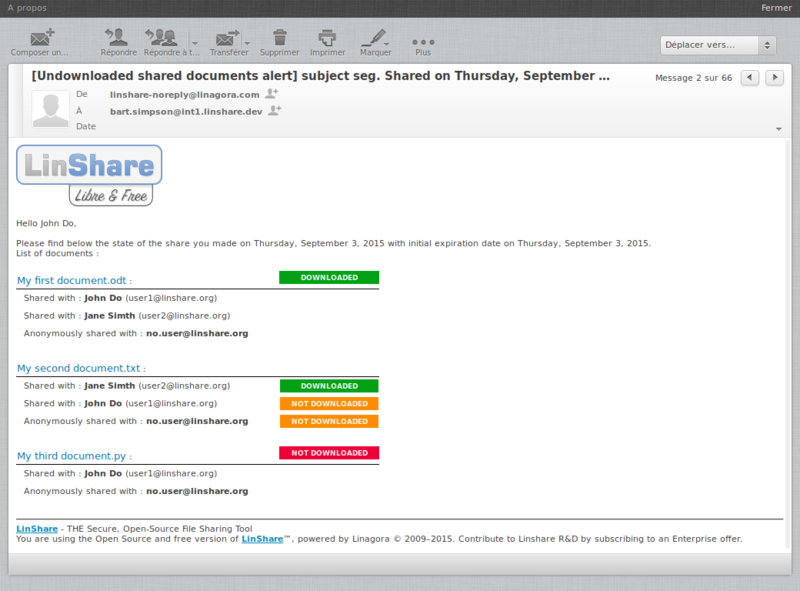 This new major release of LinShare brings a new functionality, called undownloaded shared documents alert. When you are sharing files, you can enable this feature in order to get notified if recipients have not downloaded every files after several days. Of course, you can configure this delay at sharing time. A new maintenance release of this composant is now available. It only fix one issue, mime type filtering can be disabled via LinShare Ui-Admin. This version works with every version of LinShare core 1.7.x, 1.8.x and 1.9.x. This is a maintenance release with small fixes. NB : This release needs LinShare Core 1.9.3. A new maintenance release of LinShare is now available, LinShare 1.9.3, it brings some minor fixes. Fix #1006: bug on share creation to an internal user with a guest account. Fix: npe on entry creation with a guest account. Fix: description unset while creation. Fix addUser event in mailing lists. NB : No need to ugprade the database.